We love hearing from our customers, but what we love even more is knowing that our people are out and about making a real difference in the lives of those we serve. Recently, we received a letter in the mail from a local couple expressing their thanks to our team, who came together to make sure their comfort was fully taken care of when they needed us the most. We are simply humbled by the words they wrote, and we cannot than them enough for their expression of gratitude toward our company. We found out about Reliant through Angie’s List. As a result of that, we placed a lot more trust in Reliant from the beginning than we might have otherwise because of your excellent rating. However, nothing could have prepared us for the service that we received from your company. We are both in our 90s and we did not welcome finding out that our unit – almost predictably – went out the day before the first freeze of 2015. After several estimates, we decided to get our new unit installed by Reliant. We live in a condo and there were numerous problems to work out. 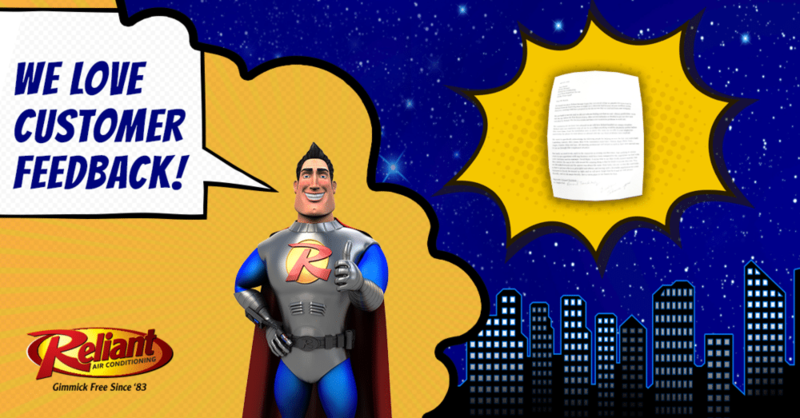 We wanted to let you know how pleased we are with how Reliant handled our unique situation. Your employees went all out for us so that everything would be absolutely perfect before they were done. From the installation crew, to others who came out on calls, to your employees answering the phone, we were always so pleased with the way these problems were resolved. We want to specifically acknowledge the following people for helping us over the last year and a half. Lapolena, Gabriel, Abel, James, Matt H. (the installation supervisor), Clinton, Raul, Chris, Gary, Keith, Angie, Connie, Sissy, and Lacy. All are amazing, professional, and helped us each in their own special way to see us through this complicated situation. But lastly, we need to say, and it is the reason for us writing you this letter, that nothing in recent years in our experience with any business, could have been compared to the experience we had with your customer service manager, David. It seems trite to say that words cannot express, but they cannot. He was so fair with us, and the amazing thing is that he treats everyone this way. Yes, we did ask around, and the answer was always the same. How lucky you are, in this day and time, to have a person who is so principled and ethical and leaving such a favorable impression for your business as David. He treated us right, and we will never forget him for it. We will always literally, and we do mean literally, have a warm place in our hearts for him. We want to take this time to express our gratitude toward each and every one of our team members, those mentioned here and beyond, for the outstanding customer service you provide our customers. At the end of the day, our business exists to improve lives, and it warms our hearts (and also theirs) to know that we will be there to serve and comfort. You are all truly everyday heroes, and in the spirit of this couple’s letter, thank you. If you’re in need of reliable heating and air repair or replacement, Reliant Air Conditioning will be there for you with the AC service and AC repair Dallas and Fort Worth have depended on since 1983. We’re proud to be your local, gimmick-free HVAC services provider, and we’re so proud to serve our customers.